Jigsaw presents the individual reports in a document collection and the entities within those reports through a series of visualizations. We call these visualizations the system views. Below, we illustrate each view provided by the system and briefly describe their characteristics. Click on the individual images to see a larger version of the view. Also, a tutorial video illustrates the different views as well and the interactive behavior for each view can be seen on the video tutorial page. All views share a Bookmarks menu which has commands to save any window and its state for resumption later. Also, in the upper right corner of a view is a small icon showing a satellite dish. This icon indicates that view is listening for system events and will update its presentation as new events occur. When the user clicks on this icon, a red line is drawn through it to indicates that the view is no longer listening to system events and thus will only change what is shown by direct interaction from the user. The icon is a toggle button so that clicking on it again will turn event listening back on. 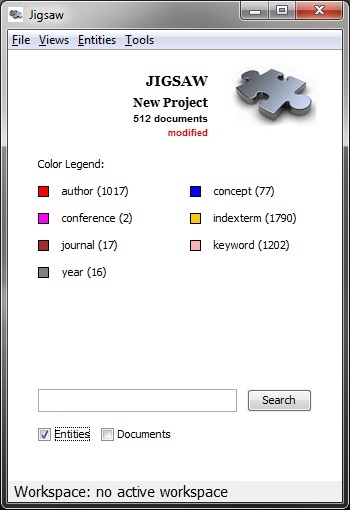 Views in Jigsaw often show connections between entities across the document collection. Two entities are considered to be "connected" if they appear in at least one document together. Entities are considered more strongly connected as they appear in more and more documents together. Control Panel - The Control Panel provides a variety of menu commands for use in the system and a search bar in which the user can enter strings to be searched, either as parts of entity names or as plain text in the documents. When a valid entity from the system is queried, all the visible views display that entity in the appropriate context of that view. When a plain text term is entered, all documents containing that term are loaded in the Document View. The Control Panel also displays number of documents in the collection being investigated, the different types of entities (each assigned a unique color), and the number of entities found of each type. Document View - The Document View presents a set of documents from the collection. 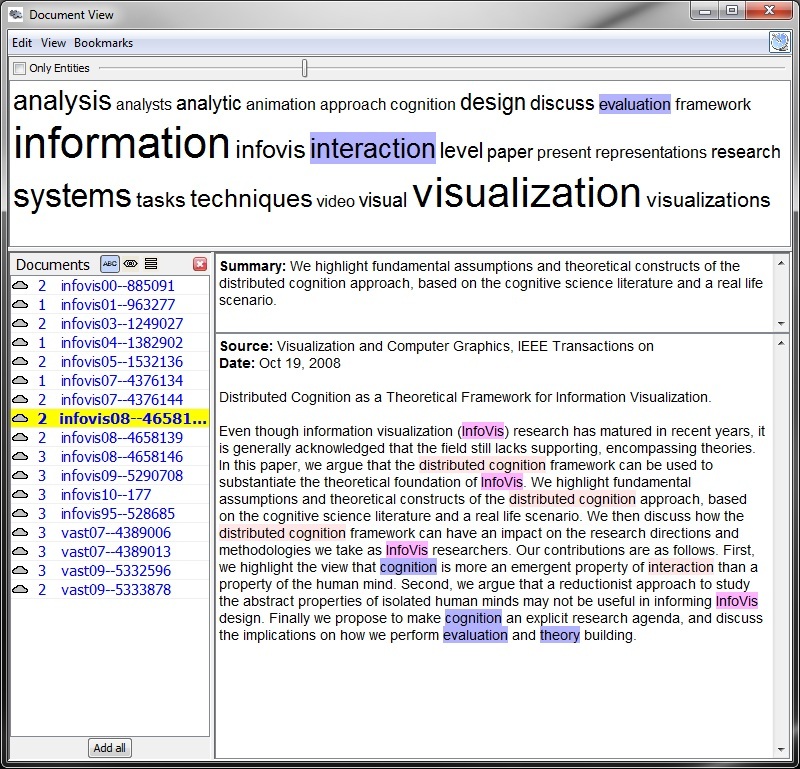 A list of the loaded documents is shown to the lower left, and the one currently selected for viewing is highlighted in yellow (its text is shown to the right). Every time a document is viewed, a counter increments to help the investigator keep track of readings. All the documents with grayed-in clouds in the left list contribute toward the word cloud at the top of the view which presents the key terms being mentioned across this set of documents. In the actual selected document view, named entities are colored in a background pastel shade of the entity color type shown in the Control Panel. The one sentence from the document that "best summarizes" the document is shown above the actual document text. List View - The List View presents a set of lists of entities of different types. The user can add and remove lists through a menu command. Thus, a wider view window can support the display of more lists. At the top of each list are a set of buttons and a menu for controlling the appearance of the list. The menu allows the user to designate what entity type should be shown in that list. Note that the same entity type can be shown in multiple lists. Different buttons control features such as the justification of entities in the list (left, center, right) and the ordering of entities. 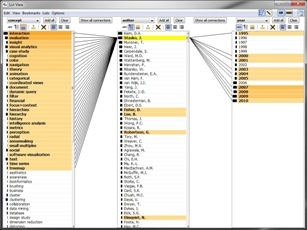 Entities can be listed alphabetically, by frequency of appearance across the document collection, or by strength of connection to the selected entities The small black bars to the left of the entities indicate each entity's frequency of appearance across the collection as well. When the user clicks on an entity, it is "selected" and shown with a yellow background. Multiple entities can be selected within and across lists using control-click and shift-click as well. When an item or items are selected, all of the other entities update their appearance. If an entity is not connected to any of the selected entities, it is shown in the default white background. 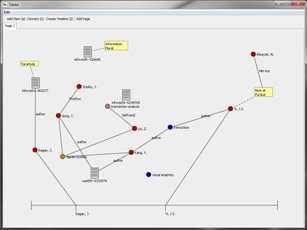 Entities that are connected to at least one of the selected items are shown with an orange background. Stronger connections are indicated by darker shades of orange. In addition, connected items in neighboring lists can be joined by lines to further indicate individual connections. As a list becomes longer and longer, many items may not be visible in the view. Consequently, a button is provided at the top of each list to bring all selected and connected items up to the top of the list. The default display mode is "OR". That is, when multiple entities are selected, other entities connected to any one or more of those selected ones are colored in orange. The viewer can change the mode to "AND" via a button in the upper right which means that only entities connected to each and every one of the selected items will be colored in orange. Document Cluster View - The Document Cluster View represents all the documents in the collection as small rectangles. The user can drag and move individual documents or sets of documents to make different clusters. 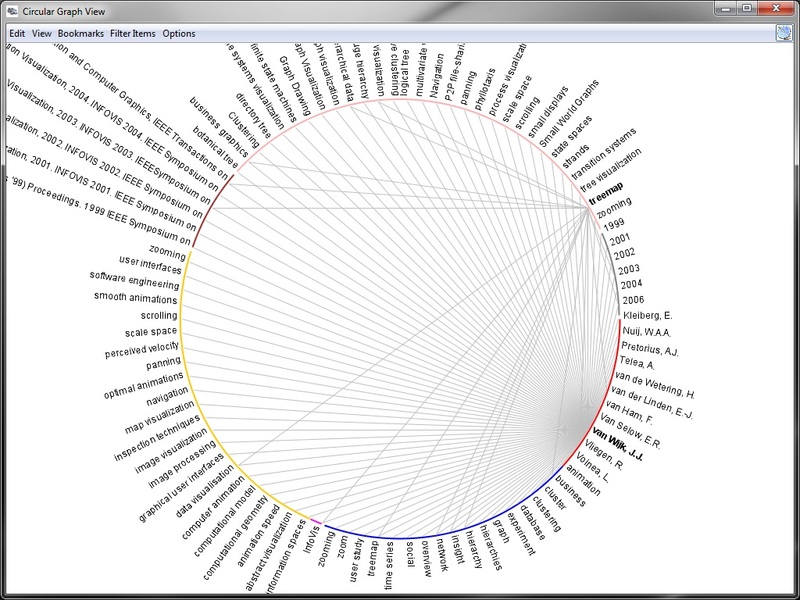 In addition, each query issued in the control panel adds a filter to the upper left region. The documents then can be segregated depending upon which of those terms they contain (different groups are assigned different colors). The View also contains buttons in the lower left to automatically cluster, based on similarity, the documents based on the source text of each document or the sets of entities per document. The button in the top left will highlight (via a yellow outline) all the documents in the collection that the analyst has read so far. 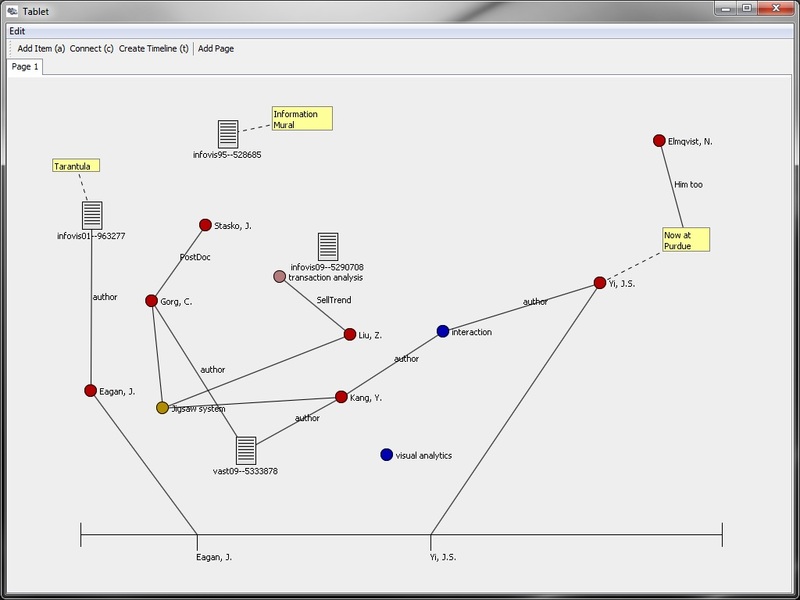 Graph View - The Graph View presents documents and the entities within them through a traditional node-link graph visualization. Rather than drawing the entire document/entity collection through one graph layout, Jigsaw provides an interactive exploration-style Graph View. Documents are slightly larger white rectangles and entities are slightly smaller circles, colored by the entity type. The entities within a document are usually drawn as a cloud around the document in which they appear. An entity is only ever drawn once, however, so entities in multiple documents are indicated by one circle that is connected to different documents (rectangles). When the user searches for an entity or issues an entity "show" command, that entity is added to the view. The view is interactive so that the user can click on any document or entity and drag it to a new location. Dragging a document brings with it all the entities only connected to it. (Entities connected to other documents as well retain their position during such a move, however.) Double-clicking on a document is a toggle-style command that either shows or hides the entities connected to that document. Double-clicking on an entity displays all the different documents in which it appears. 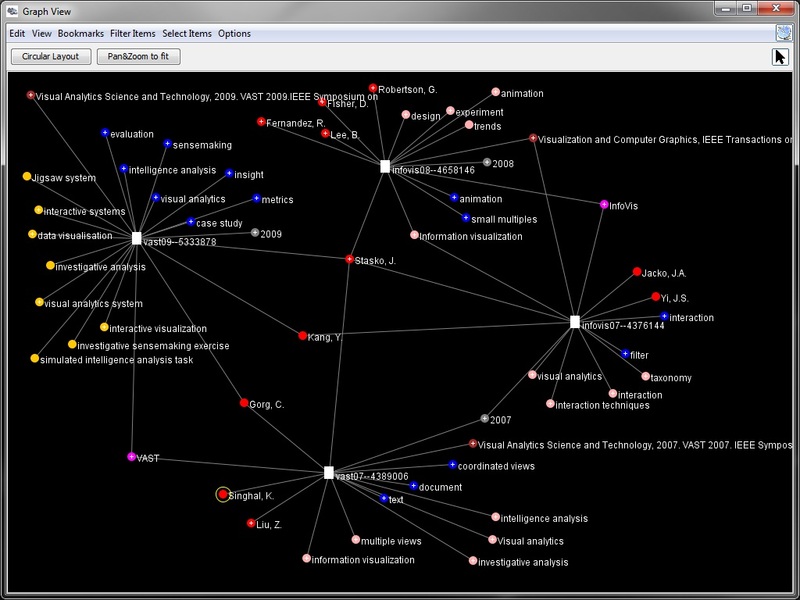 When new entities are added to a crowded view, they may be positioned outside the current visible area, but the Jigsaw Graph View will automatically zoom out to make sure all are visible after the command. The Graph View also contains one special layout command, "Circular Layout", that will reposition all the items in the view. Document rectangles are drawn at equally spaced positions around a large logical circle in the view. All the entities only appearing in one document are drawn outside the logical circle but near that document. Entities appearing in more than one document are drawn inside the circle. Entities appearing in the most documents are drawn closer to the center. The view contains many menu commands for filtering (showing and hiding) different types of entities as well. 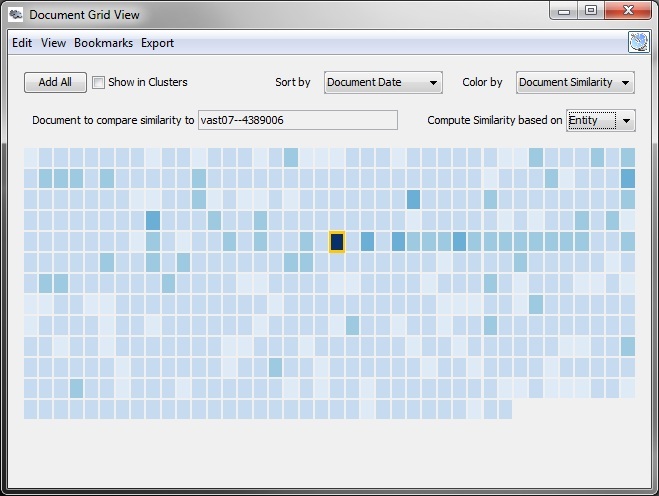 Document Grid View - The Document Grid View represents all the documents in the collection as small rectangles in a grid. The analyst can control the ordering of rectangles (top-left to botoom-right) and the shading/color of the rectangles. Each of these attributes can be mapped to document atttributes such as the size, number of entities, or date. Additionally, a particular document can be selected as the focus and then all other document's similarity to it is another attribute to be visualized. Jigsaw also can perform a sentiment analysis of the documents and this atttribute can be represented (blue-positive, red-negative). 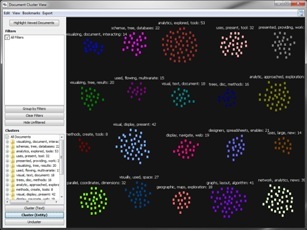 By selecting the button in the upper left, the grid is segregated into regions corresponding to different clusters of doucments as computed by Jigsaw, and then the color and ordering are shown within each cluster. Calendar View - The Calendar View presents different documents and entities from the data set in the context of a familiar calendar view. In the detailed view mode, the view shows years, months, weeks and days. In the more coarse view (shown here), the view just shows months and years. The small diamond items drawn on a particular day/month represent documents (gray) or entities (color mapping) in the context of the date(s) noted in document in which they appear. Documents or entities that are available to be shown in the Calendar are listed in the upper left. The default for an item is not to be visible. By clicking on the item's name, the user can make it visible and add it to the calendar. The color of an item can be changed from its default entity type color to help differentiate different entities too. When the number of items associated with a day is too large to all be drawn in that region, a number is drawn indicating how many others appear on that day. As the user moves the mouse over that day, a larger rectangle pops up and shows all the items. When the user moves a the mouse cursor over a document-representation diamond drawn in the calendar, all the entities appearing in that document are shown on the lower left. 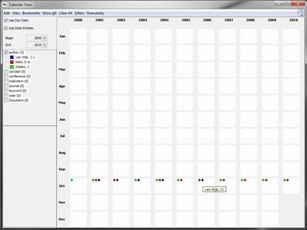 Timeline View - The Timeline View shows documents in the context of a timeline representation. Each document is represented by a "tower" of segments, each segment (thin horizontal slice) represents the entities within that document. 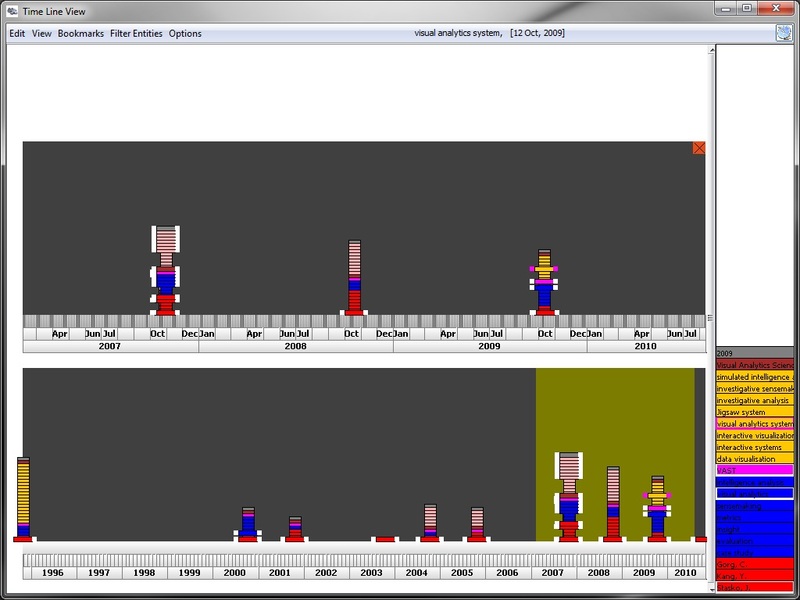 When the viewer sweeps out a smaller region on a timeline with the mouse, that region is drawn above in more detail. This operation can be repeated multiple times to allow the viewer to see finer and finer context of a particular segment of time. WordTree View - The WordTree View is adapted from the Word Tree visualization introduced by IBM researchers in the Many Eyes system. The viewer can enter at the top a word or words that appears in the document collection. The view then shows the context of that word, that is, the view shows all the trailing words that follow the search term(s) anywhere in the collection. 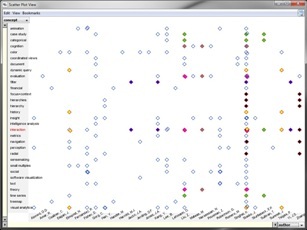 Size indicates frequency, so larger branches indicate more repeated text usage. 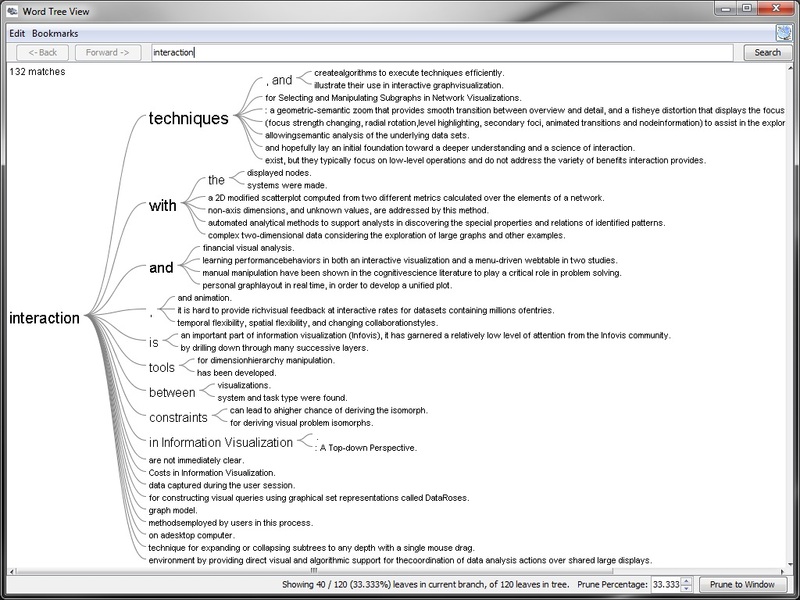 The Jigsaw WordTree View allows the user to see all trailing expressions (so the view may need to scroll vertically) or the results can be compressed and filtered to all fit in the current view without scrolling. This view helps the investigator to understand the context of a particular word or set of words in the document collection. 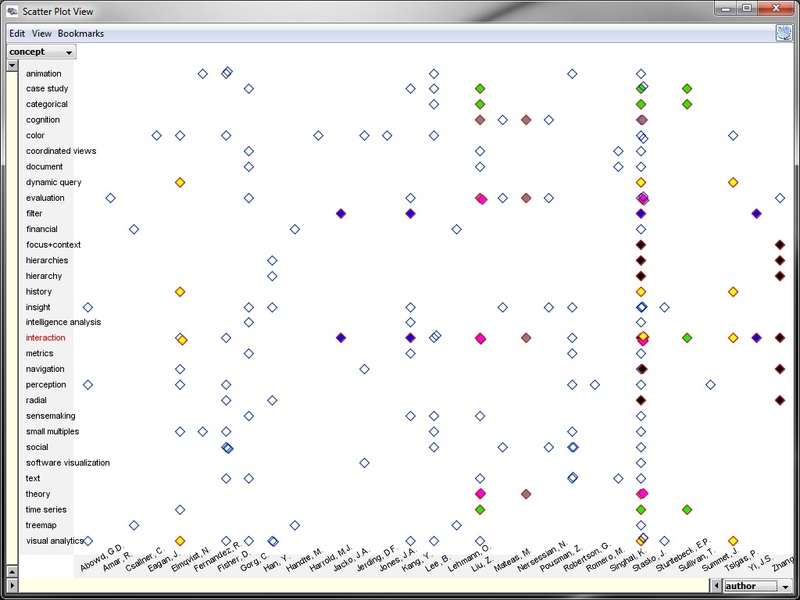 Scatterplot View - The Scatterplot View allows an analyst to place two different entity types on the two axes. 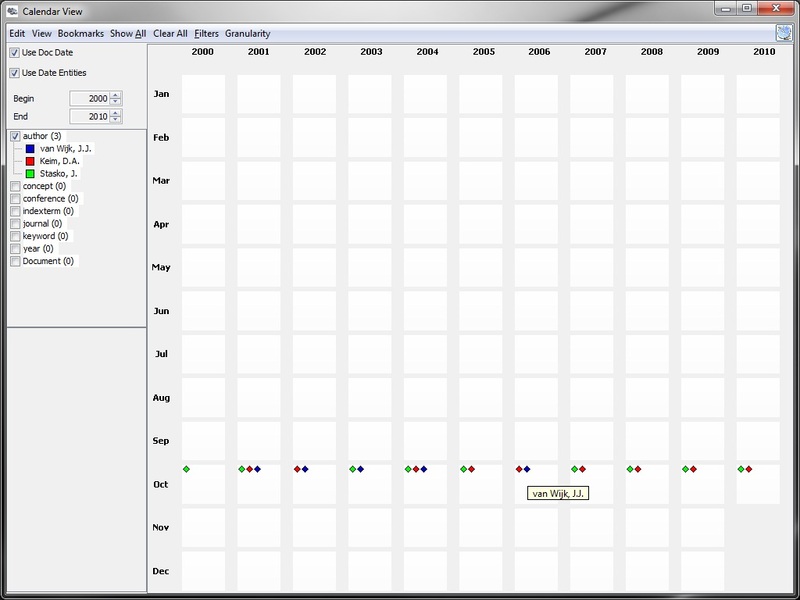 Individual entities then can be filled in on the axes through search queries and interactive "show" commands. When a pairing of a plotted entity from the x axis and from a plotted entity on the y axis corresponds to a connection (ie, the two entities appear together in a document or documents), then a diamond is drawn at the crossing of their respective horizontal and vertical positions to represent that document containing both. The user can also assign particular colors to the different documents so that s/he can more easily see the different entity-entity pairings in a document. When an axis becomes crowded from too many entities being drawn on it, the user can use the two range sliders to narrow in on a particular region of the axis. Circular Graph View - The Circular Graph View plots different entities from the collection around the circumference of a circle. Different entity types are grouped in different regions of the circumference (indicated by color). 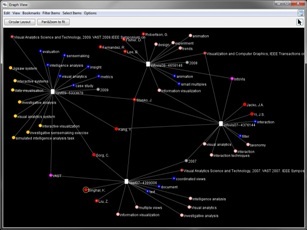 By clicking on an entity name, the investigator selects it (shown in bold) and lines are drawn to all of the connected entities. Multiple entities can be selected via control-click of the mouse button. Tablet - The Tablet is not really a document/entity view like the others above. Instead, it is a window with Jigsaw that provides some basic evidence marshalling support and functions as an electronic notebook or tablet where the analyst can take notes, develop hypotheses, and organize his/her thoughts. The investigator can add relevant entities and documents from other views to the Tablet. These added items then can be linked together via lines (eg, to show a social network), can be connected to a timeline, or can have notes connected to them. Additionally, the state of different views in Jigsaw can be "bookmarked" and added to the Tablet. That state then can be recreated via this item. The Tablet also supports multiple tabs/windows to manage different parts of the investigation.